Where has 2012 gone?! It certainly has seemed to fly. 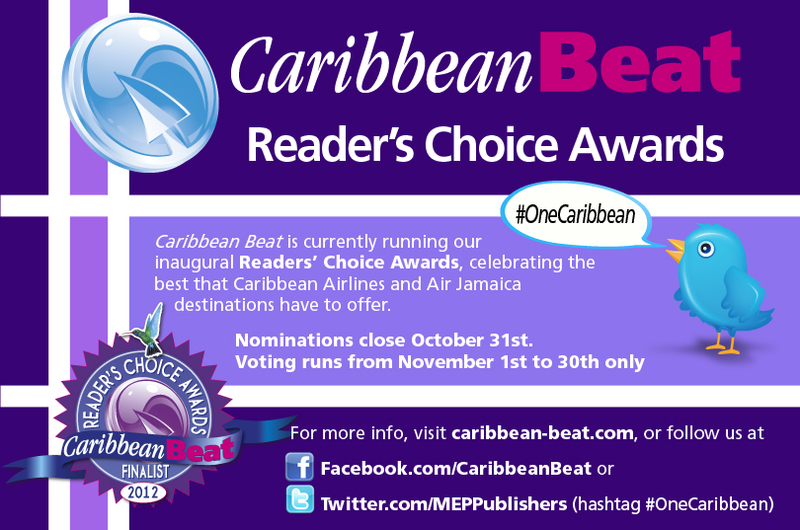 We’re already unveiling our brand new issue of Caribbean Beat newsletter (#118: November/December 2012) is on Caribbean Airlines and Air Jamaica planes; in the mail to subscribers; and online, where you can also access a complete flip-book of the current issue – free! Read on for more on what’s inside this festive issue, and how to vote for your favourite Caribbean places and experiences in the Reader’s Choice Awards! VOTING has begun for our inaugural Readers’ Choice Awards! Polls remain open just until 30 November, so don’t delay! Read more about the Awards and vote for your favourites here. The last two months of the year are a season of festivals across the Caribbean, starting with Divali and culminating with Christmas celebrations of all kinds. The November/December issue of Caribbean Beat magazine explores a spectrum of events across the region, starting with the cover image, depicting an ornately illuminated float from one of Guyana’s Divali motorcades. Transforming streets around Georgetown into a glowing spectacle, the Divali motorcades feature elaborately decorated trucks and tens of thousands of lights, parading to the accompaniment of religious and Bollywood film music. 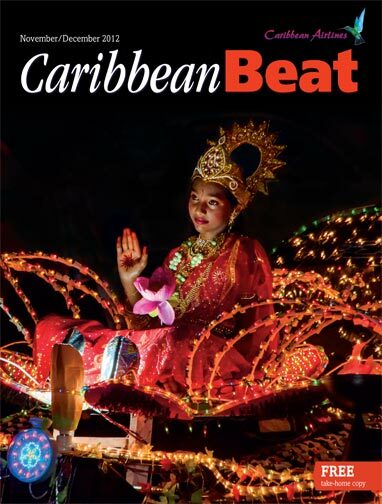 This issue of Caribbean Beat also visits the Shia Muslim holiday of Hosay, commemorated for over a century in Trinidad with nighttime processions of flags, brightly coloured replicas of Islamic tombs, and — most memorably — the solemn rhythms of tassa drumming. Elsewhere, the magazine looks at the Christmastime Jonkonnu masquerade in Jamaica and talks to a young Trinidadian musician about the new generation keeping parang — traditional Spanish-inflected Christmas music — alive and energetic. The “Cookup” column rounds off Beat’s Christmas coverage with advice on devising a festive menu for vegetarian or gluten-averse guests. “Immerse”, the magazine’s arts and culture section, opens with a portfolio of seven emerging talents in Barbados’s contemporary art scene, young up-and-comers rethinking the rules and changing the game. This issue also profiles the Guyanese artist and archaeologist George Simon, whose recent remarkable discoveries in the Berbice Mounds may cause the history of the Western Hemisphere to be rewritten. Meanwhile, in St Lucia, filmmaker Davina Lee talks about the evolution of her debut short The Coming of Org, and how growing up in an artistic household helped shape her creative vision. Caribbean Beat’s travel section, “Arrive”, takes readers to tiny Petite Martinique, north of Grenada — one of the smallest inhabited islands in the Caribbean, but connected to the extended family of the Grenadine chain by a constant traffic of boats. And with the Bahamas International Film Festival scheduled for early December, Bahamian filmmaker Kareem Mortimer provides a personal tour of Nassau for visitors — including all the best places to enjoy a daiquiri, his favourite cocktail. The magazine’s “Engage” section offers readers food for thought, and an introduction to people and projects making a difference across the Caribbean. The “Inspire” column meets author Joanna Hillhouse, founder of the Wadadli Pen competition, which supports and rewards budding writers in Antigua and Barbuda. The “Green” column looks at how the Nature Conservancy works to protect Jamaica’s main fishing grounds at Pedro Bank, essential both for the marine ecosystem and for the livelihood of fishermen who depend on it. And the new “Plugin” column looks at the popularity of Internet memes — which can combine idle entertainment and biting social commentary on Caribbean life and politics. Dispatches on upcoming events — from beach tennis in Aruba to a kite festival in Tobago — help round off the November/December Caribbean Beat, plus the magazine’s style column, “The Look”, and an insightful reviews section suggesting books, music, and films to keep readers busy until year-end.